R&J #351 - The Saddest Tennis Ball - The Mike O'Meara Show The Mike O'Meara Show R&J #351 - The Saddest Tennis Ball - The Mike O'Meara Show | A fun mash-up of real life, pop-culture, news of the day, dynamic audio clips, and three guys busting each others’ balls. Rob reflects on his career and seriously considers his next big move. Joe meets a fan whom he convinces to join Patreon. Joe gets extremely uncomfortable when his friend and former landlord repeats his private joke to a stranger. Rob shows irresponsible handling of money when he pays to see Black Panther when he could have easily gone for free. Chris Restivo is called with an offer of sympathies about some recent tragedy in his life, and also to ask him about the status of Joe’s shirt delivery. Joe is stunned to learn some of the things that people don’t know. Rob thinks its about time that Joe updated his website. Rob and Joe debate the Mt. Rushmore of crackers and whether or not a Graham is qualified for inclusion. Rob talks about the recently unearthed OJ Simpson interview, and asks Robby to play his hypothetical game “If I did It”. 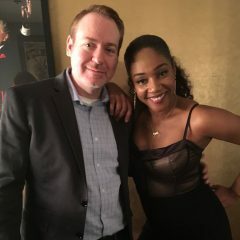 Rob was on a series of successful theater shows with Tiffany Haddish and has built a very close relationship with the comedy superstar, but he still won’t have her as a guest on this show.